What is a tricky question? Well, tricky Java interview questions are those questions which have some surprise element on it. If you try to answer a tricky question with common sense, you will most likely fail because they require some specific knowledge. Most of the tricky Java questions comes from confusing concepts like function overloading and overriding, Multi-threading which is really tricky to master, character encoding, checked vs unchecked exceptions and subtle Java programming details like Integer overflow. Most important thing to answer a tricky Java question is attitude and analytical thinking, which helps even if you don't know the answer. Anyway in this Java article we will see 10 Java questions which are real tricky and requires more than average knowledge of Java programming language to answer them correctly. As per my experience, there is always one or two tricky or tough Java interview question on any core Java or J2EE interviews, so it's good to prepare tricky questions from Java in advance. If I take an interview, I purposefully put this kind of question to gauge the depth of candidate's understanding in Java. Another advantage of asking such question is the surprising element, which is a key factor to put the candidate on some pressure during interviews. Since these questions are less common, there is good chance that many Java developer doesn't know about it. 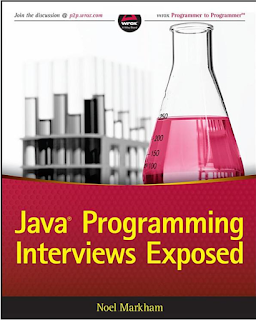 You won't find these questions even on popular Java interview books like Java Programming Interview exposed, which is nevertheless an excellent guide for Java interviews. Btw, if you don't find these question tricky enough, then you should check Joshua Bloch's another classic book, Java Puzzlers for super tricky questions. I am sure you will find them challenging enough. Here is my list of 10 tricky Java interview questions, Though I have prepared and shared lot of difficult core Java interview question and answers, But I have chosen them as Top 10 tricky questions because you can not guess answers of this tricky Java questions easily, you need some subtle details of Java programming language to answer these questions. Question: What does the following Java program print? Answer: This question is tricky because unlike the Integer, where MIN_VALUE is negative, both the MAX_VALUE and MIN_VALUE of the Double class are positive numbers. The Double.MIN_VALUE is 2^(-1074), a double constant whose magnitude is the least among all double values. So unlike the obvious answer, this program will print 0.0 because Double.MIN_VALUE is greater than 0. I have asked this question to Java developer having experience up to 3 to 5 years and surprisingly almost 70% candidate got it wrong. What will happen if you put return statement or System.exit () on try or catch block? Will finally block execute? This is a very popular tricky Java question and it's tricky because many programmers think that no matter what, but the finally block will always execute. This question challenge that concept by putting a return statement in the try or catch block or calling System.exit() from try or catch block. Answer of this tricky question in Java is that finally block will execute even if you put a return statement in the try block or catch block but finally block won't run if you call System.exit() from try or catch block. Question: Can you override a private or static method in Java? Another popular Java tricky question, As I said method overriding is a good topic to ask trick questions in Java. Anyway, you can not override a private or static method in Java, if you create a similar method with same return type and same method arguments in child class then it will hide the superclass method, this is known as method hiding. Similarly, you cannot override a private method in sub class because it's not accessible there, what you do is create another private method with the same name in the child class. See Can you override a private method in Java or more details. Question: What do the expression 1.0 / 0.0 will return? will it throw Exception? any compile time error? Answer: This is another tricky question from Double class. Though Java developer knows about the double primitive type and Double class, while doing floating point arithmetic they don't pay enough attention to Double.INFINITY, NaN, and -0.0 and other rules that govern the arithmetic calculations involving them. The simple answer to this question is that it will not throw ArithmeticExcpetion and return Double.INFINITY. Also, note that the comparison x == Double.NaN always evaluates to false, even if x itself is a NaN. To test if x is a NaN, one should use the method call Double.isNaN(x) to check if given number is NaN or not. If you know SQL, this is very close to NULL there. Does Java support multiple inheritances? This is the trickiest question in Java if C++ can support direct multiple inheritances than why not Java is the argument Interviewer often give. Answer of this question is much more subtle then it looks like, because Java does support multiple inheritances of Type by allowing an interface to extend other interfaces, what Java doesn't support is multiple inheritances of implementation. This distinction also gets blur because of default method of Java 8, which now provides Java, multiple inheritances of behavior as well. See why multiple inheritances are not supported in Java to answer this tricky Java question. What will happen if we put a key object in a HashMap which is already there? This tricky Java question is part of another frequently asked question, How HashMap works in Java. HashMap is also a popular topic to create confusing and tricky question in Java. Answer of this question is if you put the same key again then it will replace the old mapping because HashMap doesn't allow duplicate keys. The Same key will result in the same hashcode and will end up at the same position in the bucket. Each bucket contains a linked list of Map.Entry object, which contains both Key and Value. Now Java will take the Key object from each entry and compare with this new key using equals() method, if that return true then value object in that entry will be replaced by new value. See How HashMap works in Java for more tricky Java questions from HashMap. Answer: The trickiness of this question lies on character encoding and how String to byte array conversion works. In this program, we are first creating a String from a character array, which just has one character '\u0097', after that we are getting the byte array from that String and printing that byte. Since \u0097 is within the 8-bit range of byte primitive type, it is reasonable to guess that the str.getBytes() call will return a byte array that contains one element with a value of -105 ((byte) 0x97). However, that's not what the program prints and that's why this question is tricky. As a matter of fact, the output of the program is operating system and locale dependent. On a Windows XP with the US locale, the above program prints , if you run this program on Linux or Solaris, you will get different values. To answer this question correctly, you need to know about how Unicode characters are represented in Java char values and in Java strings, and what role character encoding plays in String.getBytes(). In simple word, to convert a string to a byte array, Java iterate through all the characters that the string represents and turn each one into a number of bytes and finally put the bytes together. The rule that maps each Unicode character into a byte array is called a character encoding. So It's possible that if same character encoding is not used during both encoding and decoding then retrieved value may not be correct. When we call str.getBytes() without specifying a character encoding scheme, the JVM uses the default character encoding of the platform to do the job. The default encoding scheme is operating system and locale dependent. On Linux, it is UTF-8 and on Windows with a US locale, the default encoding is Cp1252. This explains the output we get from running this program on Windows machines with a US locale. No matter which character encoding scheme is used, Java will always translate Unicode characters not recognized by the encoding to 63, which represents the character U+003F (the question mark, ?) in all encodings. If a method throws NullPointerException in the superclass, can we override it with a method which throws RuntimeException? One more tricky Java questions from the overloading and overriding concept. The answer is you can very well throw superclass of RuntimeException in overridden method, but you can not do same if its checked Exception. See Rules of method overriding in Java for more details. where an id is an integer number. Well, three is nothing wrong in this Java question until you guarantee that id is always positive. This Java question becomes tricky when you can't guarantee that id is positive or negative. the tricky part is, If id becomes negative than subtraction may overflow and produce an incorrect result. See How to override compareTo method in Java for the complete answer of this Java tricky question for an experienced programmer. How do you ensure that N thread can access N resources without deadlock? If you are not well versed in writing multi-threading code then this is a real tricky question for you. This Java question can be tricky even for the experienced and senior programmer, who are not really exposed to deadlock and race conditions. The key point here is ordering, if you acquire resources in a particular order and release resources in the reverse order you can prevent deadlock. See how to avoid deadlock in Java for a sample code example. Now tell us, is it possible for Thread 2 to print “x=0”? Answer: It's impossible for a list of tricky Java questions to not contain anything from multi-threading. This is the simplest one I can get. Answer of this question is Yes, It's possible that thread T2 may print x=0.Why? because without any instruction to compiler e.g. synchronized or volatile, bExit=true might come before x=1 in compiler reordering. Also, x=1 might not become visible in Thread 2, so Thread 2 will load x=0. Now, how do you fix it? When I asked this question to a couple of programmers they answer differently, one suggests to make both threads synchronized on a common mutex, another one said make both variable volatile. Both are correct, as it will prevent reordering and guarantee visibility. But the best answer is you just need to make bExit as volatile, then Thread 2 can only print “x=1”. x does not need to be volatile because x cannot be reordered to come after bExit=true when bExit is volatile. Relatively newer Java tricky question, only been introduced from Java 5. The main difference between both of them is that you can reuse CyclicBarrier even if Barrier is broken, but you can not reuse CountDownLatch in Java. See CyclicBarrier vs CountDownLatch in Java for more differences. What is the difference between StringBuffer and StringBuilder in Java? Classic Java questions which some people think tricky and some consider very easy. StringBuilder in Java was introduced in JDK 1.5 and the only difference between both of them is that StringBuffer methods e.g. length(), capacity() or append() are synchronized while corresponding methods in StringBuilder are not synchronized. Because of this fundamental difference, concatenation of String using StringBuilder is faster than StringBuffer. Actually, it's considered the bad practice to use StringBuffer anymore, because, in almost 99% scenario, you perform string concatenation on the same thread. See StringBuilder vs StringBuffer for more differences. Can you access a non-static variable in the static context? Another tricky Java question from Java fundamentals. No, you can not access a non-static variable from the static context in Java. If you try, it will give compile time error. This is actually a common problem beginner in Java face when they try to access instance variable inside the main method. Because main is static in Java, and instance variables are non-static, you can not access instance variable inside main. See, why you can not access a non-static variable from static method to learn more about this tricky Java questions. 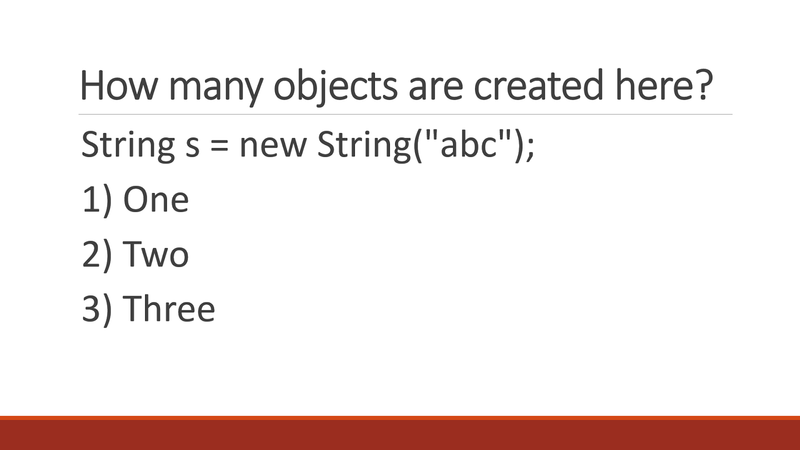 How many String objects are created by the following code? Now, it's practice time, here are some questions for you guys to answer, these are contributed by readers of this blog, big thanks to them. When doesn't Singleton remain Singleton in Java? is it possible to load a class by two ClassLoader? is it possible for equals() to return false, even if contents of two Objects are same? Why compareTo() should be consistent to equals() method in Java? When do Double and BigDecimal give different answers for equals() and compareTo() == 0. How does "has before" apply to volatile work? Why is (Integer) 1 == (Integer) 1 but (Integer) 222 != (Integer) 222 and which command arguments change this. What happens when an exception is thrown by a Thread? Difference between notify() and notifyAll() call? Difference between System.exit() and System.halt() method? Does following code legal in Java? is it an example of method overloading or overriding? This was my list of Some of the most common tricky questions in Java. It's not a bad idea to prepare tricky Java question before appearing for any core Java or J2EE interview. One or two open-ended or tricky question is quite common in Java interviews. 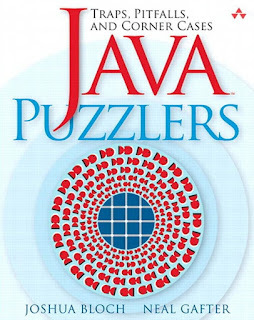 If you are looking for super challenging trick coding questions then you should check out Joshua Bloch another classic book, the Java Puzzlers, I am sure you ill find them really challenging to solve, I certainly did. Great questions, How about adding tricky questions related to programming exercise ? One of the most tricky questions, I have face in a Java interview was, Does two object will always be equal, when there compareTo() method returns zero? I said, Yes, but that was not true. Though most of the classes will be equal if there compareTo() return true e.g. java.lang.String, but it's not mandatory. compareTo() may be inconsistent to equals(), which means compareTo() may return zero, but object will not be equal by equals() method. One of the prime example of this is java.math.BigDecimal class, whose equals() method return true if two BigDecimal object is equal in both value and scale e.g. 6.0 and 6.00 will not be equal, but compareTo() will return zero if both objects are compared. This was really tricky, until you had faced similar question previously. In another interview, my friend was asked this question little differently, Can we store BigDecimal class in TreeSet? obviously No, because of above reason, BigDecimal class can produce unexpected behavior when stored in SortedSet or SortedMap. While I'm an certain these questions are getting asked, I find it ironic that being able to answer them in no way indicates any ability to be a successful programmer. That is why they are trick questions I guess. I am able to override public static method declared in base class in its subclass. It won't because compiler will treat it as different method. This is called method hiding and its indeed one of the tricky Java question. Remember that this method is not overriding super class method as static method bonded using type information. That's the reason this Java question is tricky. One of the tricky Java question I faced is "What is difference between Collection and Generics in Java", its not tricky because I don't know either collection or Generics but How can you compare Generics with Collection ? Correct both are diff things and they are not related at all..
Is the line in codes correct. It's one of ur question. Can you access non static variable in static context? Another tricky Java question from Java fundamentals. "No you can not access static variable in non static context in Java". Read why you can not access non-static variable from static method to learn more about this tricky Java questions. Hi Ankur, Thanks for pointing out, you should read opposite i.e non static variable can not accessible from static context. This always confuse if you don't remember it and that's why its one of the tricky question. This line is not correct. "No you can not access static variable in non static context in Java". you can not access a static variable inside the non-static one,other-way its so true. its really nice tricky question to read to face interview. These are definitely a good set of tricky questions that a candidate may face during an interview. I certainly enjoyed going through them but I have a different opinion regarding the last question: Can you access non static variable in static context? Is the compareTo code correct ? the references look to be wrong. The explanation of the last question is little bit confusing. Actually static variables are always accessible in non static context however the reverse is not true. In static context, you can access non-static variables - by creating a new instance of the object. Hence the reverse is partly true. I should also mention that you shouldn't cast to Employee without knowing it's an Employee via instanceof, or just using Comparable generic interface. Before calling System.exit(0) you raised excetion "int a=2/0". Onces system.exit(0) is called finally will never called. as per my java knowledge,try,finally blocks will execute parallely,because if single statement(inside try block first line or empty block) is executed corresponding catch may or may not execute but finally block will execute automatically,otherwise it wont execute,so without try&catch blocks we cant write finally block in java. System.exit(0) is unreachable statement here. linklist is dynamic is called at runtime to save memory. where as arrylist is not dynamic whose memory locations are allocated in memory so memory is already stored for that so memory is waste. if u have shortage of memory can use linklist it is envoke at runtime and if u have enough memory can use arraylist..
What is so tricky about these question, to me they look most simplest question, which doesn't even qualify for Interviews. Tricky questions are those, who challenge your notion e.g. When Singleton doesn't remain Singleton in Java? is Following code legal in Java? is it example of method overloading or overriding? Anyone disagree with my questions not being tricky? Trickier) When do Double and BigDecimal give different answers for equals() and compareTo() == 0. Good collection of tricky questions, However I feel that the questions in the interview becomes tricky because we need to answer the same as what interviewer in thinking is correct, this is the most tricky part. It is always better to clarify the question correctly by rephrasing it. 1a) how do you prevent a return statement from calling finally. 1b) how do you make a System.exit() call the finally block. 3a) how does "has before" apply to volatile work? 3c) why is (Integer) 1 == (Integer) 1 but (Integer) 222 != (Integer) 222 and which command arguments change this. What happens when exception is thrown in a Thread? Difference between notify and notifyAll call? do you agree these are much trickier question for an average Java programmers? Is there a System.halt() method exists in Java? I think it is Runtime.getRuntime().halt(status), right? Thanks for sharing these. I need some good Java interview questions and a few of these might help me out. No problem Tom, thanks for dropping by, If you have not read already, you may find my article about 10 Questions to make Programming Interview Less Costly useful as well. Answer to the question "is it possible to load a class by two ClassLoader?" is Yes, it quite possible if you are using a custom class loader or working on managed environment which uses classloader e.g. web and application server. This is one more reason why you should use instanceof instead of getClass() while overriding equals() mehtod, otherwise equals() will return false even if object are same but classloader is different. this is hari.can you any one send me jsp&servlets 1.6 year interview questions. How would you describe Enum<E extends Enum<E> > ? About Q2: What will happen if you put return statement or System.exit () on try or catch block ? Will finally block execute? It will compile without errors? If yes, what do you think it will produce on console as output? Pass by value and pass by reference is also a good tricky Java question. Btw, Java is always pass by value, even for objects its pass by value, its just that reference or handle to the object is passed. can we declare constructor as private??? if yes then for which purpose?? We declare constructor as private if we want to implement singleton pattern. Also, If you want to create only 1 instance of your custom class then you can use private constructor. Please,write me if I am missing anything. Hi Sandeep, Yes, you can declare a private constructor in Java. You can do to prevent instantiation of class outside the class, for example, Singleton pattern is one of the prime examples of the private constructor. In Singleton, the class itself is responsible for creating the instance and managing it so constructor is made private. A fiend who is a really good programmer was given some of these in an interview a few months ago. His response was: "I'd fire who every wrote such lousy code. I never have to worry about such things, because I write defensive and don't allow such nonsense in my code base"
He didn't get the job, but he's right.Most of this "trick" questions are are just academic and should never occur to in real life. It's lousy people think these type of questions some how gauge the productivity and ability of a programmer who avoids such pitfalls to begin with and hence doesn't know the answers to the way out of them. I think in practice questions "How does "has before" apply to volatile work? ", you mean how "happens before" concept work with volatile variables? right? as far as I know there are certain rules which decides which update will happen first. I remember reading about it on Java concurrency in Practice, which says that a volatile write will happen before volatile read. Is null key allowed to stored in HashMap? If yes, how it is handled? What will happen if two different HashMap key objects have same hashcode? Visit http://modernpathshala.com/Learn/Java/Interview for more java interview questions and answers. This blog awesome and i learn a lot about programming from here.The best thing about this blog is that you doing from beginning to experts level. I said "HashSet" but it was wrong. Overriding static methods is called as method hiding.In method hiding method resolution is always based on reference type so it will print Collection. It will print "Collection" because methods are static and so they are bonded during compile time and at that time only type information is available because object is created at runtime. Honestly, these questions are poor indicators of how effective they will be on the job. They may be entertaining, but they are really bad questions when screening job candidates for real work. On the job you want people who are creative, capable of exploring available options, and capable of executing well on the tasks that they are assigned to them, large or small. These sort of "gotcha" questions do not actually tell you if they are good developers - just whether they have "happened" to stumbled upon obscure facts or details in their careers or have spend an inordinate amount of time reading java docs. Hello @Jake, I don't believe the go/no-go decision is based upon these tricky questions. They are mainly used to add the surprise element or check the depth of candidates knowledge in any particular topic. It's a good indicator of candidate's deep and thorough understanding but as you said, don't expect every Java developer knows these subtle details. One of these questions, CyclicBarrier vs CountDownLatch are asked to me on screening round, I managed to answer it well, thanks to internet and you guys. It can do both. for example, HTTP GET request return something from server but by using POST and PUT you can also create new objects into Server. Compilation error.. E is undefined. What is E? there is no E here, btw, yes it is not using generics which it could and that way you don't need that cast. I don't think TreeSet allows null becuase it's a SortedSet and it has to compare elements so if you try to compare null with anything it will result in NullPointerException, btw, it might just allow in case you have just one element. not sure but you can check that by running it yourself. How to solve FizzBuzz in Java? Building a REST API with Spring 4? Copyright by Soma Sharma 2012 to 2019. Powered by Blogger.